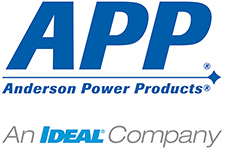 Anderson Power Products® (APP®), is an international leader in high power interconnect solutions. In 1877, Anderson began as a small company in Boston, MA making innovative trolley and railway power designs. Today as a subsidiary of IDEAL Industries® our connectors are used around the world across many markets including: Telecom & IT Equipment, Motive Power, and Alternative Energy. We have manufacturing and distribution locations in the United States, United Kingdom, China, Hong Kong, and Taiwan. APP offers a range of connectors to meet power, signal, & ground needs in protected or environmentally exposed applications. Industry leading OEM’s partner with APP for our superior custom design & qualification capabilities. Anderson Power Products is your best connection.